Type a search string into the Search box that conforms to the search syntax. The Search page displays. It has a Search box and two panes: the Filters pane and the Search Results pane. 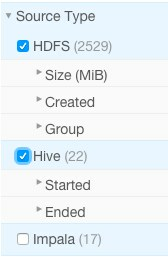 To display all entities, click Clear all filters. You filter the search results by specifying filters or typing search strings in the Search box. The following filter example demonstrates how to narrow search results by selecting a built-in Source Type filter set to HDFS and the managed property emailFrom with the value terry@example.com. All entity types can display inputs and outputs. See Configuring Display of Inputs and Outputs. If managed properties have been defined for a particular entity type, the Show All checkbox in the Managed Metadata pane displays all properties that can be assigned values for the selected entity. To display only those properties that have values, clear the checkbox. If all properties have values, the checkbox has no effect. 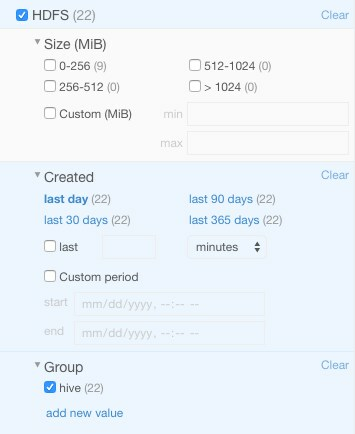 In addition to the technical metadata, this Hive table has custom metadata consisting of tags tag1 and tag2, a custom key-value pair customkey-value, and an extended Hive attribute key-value pair key1-value1. The Details page also displays the table schema. The following years directory entity has two managed properties in the MailAnnotation namespace: emailFrom and emailTo. The former is single-valued and the latter is multivalued. The Filters pane contains a set of default properties (source type, type, owner, cluster, and tags) and property values (also called facets). You can add a filter by clicking in Add Another Filter... and scrolling or by typing in the filter combo box to search for it. As you add filters, filter breadcrumbs are added between Search box and search results, and search results are refreshed immediately. Multiple filters composed with the + operator are separated with the | character. To remove nondefault filter properties, click the in the filter. If a property has no values, click add a new value, click the text box, and select from the populated values in the drop-down list or type a value. The Last checkbox, type or specify the value using the spinner control and select the unit minutes, hours, or days. To remove filter values, click the in the breadcrumb or clear the checkbox.